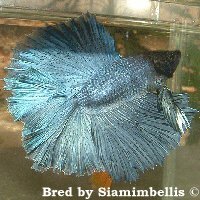 The color of Betta splendens is based on the color pigmentation in different types of cells . 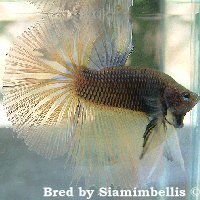 There are basically four types of color layers in a betta with each its own kind of color cells. These different color cells are present in different layers within the skin. Please note that the following description of the different color layers accounts for the body only. As the finnage is much thinner the make up of the color layers probably is entirely different there. The latter still needs to be studied. The yellow layer contains xanthophores or yellow cells. So, far no genes have identified that control the yellow layer of pigmentation. - The absence of the red layer, black layer and iridescent/blue layer. 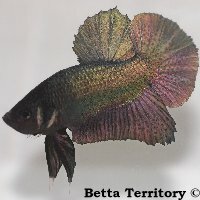 Each of these color layers has its own genetic code which is determined by series of genes which combined eventually determine the color of the betta. 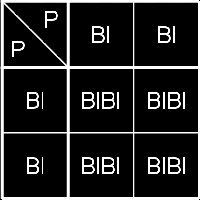 The different genes either increase of decrease the pigment in the different layers. In this chapter I will try to explain something more about these different traits. Turquoise, steel and royal blue are called the three iridescent colors. 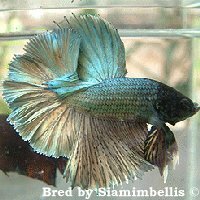 Iridescent colors make up the top layer of the betta and are caused by cells called iridocytes. These cells form a dense color layer which can cover all other colors. 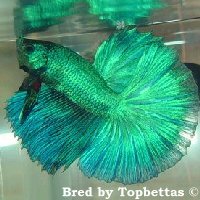 Originally, on wild Betta splendens the normal iridescent color is turquoise/green. This normal iridescence (represented by genotype sisi is limited to ray-like projections into the fins and several iridescent dots along the body of the fish. Selective breeding gave rise to a mutated iridescence gene which lead to spread iridescence (represented by genotype SiSi). 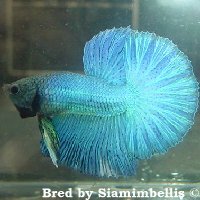 The Si gene is responsible for the increase in density and distribution of the iridescent color so that it covers the entire body and fins of the betta (with exception of the head). The spread iridescent gene is dominant to the normal (wildtype) iridescent gene. The best way to describe turquoise is, a color between blue and green. This is a lighter, greyish kind of blue. Royal blue is the darkest of the three iridescent colors and sometimes almost looks like purple. Turquoise and steel are not dominant over each other. Both colors interact to produce a blending of the two colors into a new color: royal blue. This type of inheritance is called intermediary dominance. Until now no gene has been identified that creates a complete elimination of the blue layer . 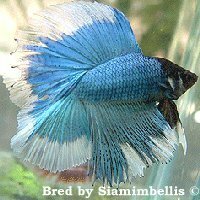 Because several breeders have bred bettas which do not show any signs of blue, the hypothesis is there that a no-blue gene exists. However in the case of a blbl (steel blue) combined with sisi (normal iridescence) the blue layer could be very limited an only give a small silver glow. 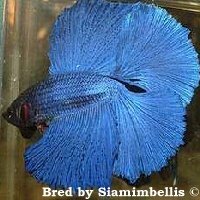 A betta with this genotype would probably not be recognized as an actual blue. 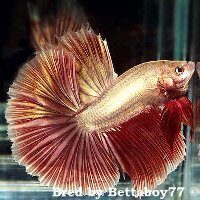 The best example of a cambodian is the traditional or red cambodian which has red colored fins and a flesh colored body (but there are also blue cambodians). 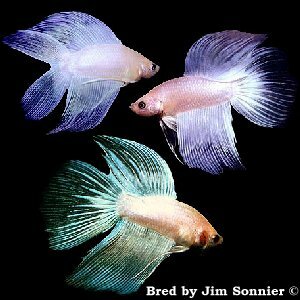 The cambodian gene causes a fish to have colored fins and colorless or greatly reduced color on the body . The cambodian trait is a recessive trait. 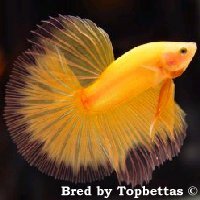 Blond bettas show a reduced density of black pigment on the body (between cambodian and black). The mutation that is responsible for the blond trait is recessive to the normal black gene. Some colors like pastels, yellows and opaques are associated with the blond gene . But the blond gene can also be found in combination with other colors like black, steel blue and red. Blonde steels will appear silver, blonde blacks will look washed out and pale and blonde reds exhibit a bright Red color, rather than the usual dark "Cherry" Red. 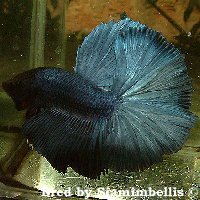 Melano black bettas are the true black bettas. A mutated gene has caused the black pigment to be greatly increased coverage area (melanism) . 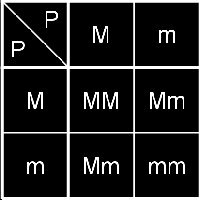 The mutated gene (m) is recessive to the normal black gene (M). 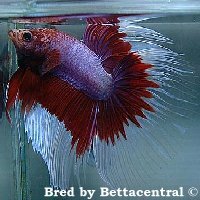 This means that when a melano black betta is spawned to a normal betta that does not have the mutated black gene, all offspring would look like multicolored bettas. These offspring are carrying the gene for melanism and are called melano-geno (Mm), however they are not distinguishable from normal multicolors. These recessive characteristics become visible in the offspring when both parents carry the mutant gene. The melanophores from melanos grow very differently from that seen in black lace and wild type . They pile up and are very sticky, which is why they produce such a dense black. Melanos have a lot of speckling throughout their fins that that make them look so dark, these are actually 'balls' of melanophores. Preliminary studies have shown that these melanophores have extra adhesion proteins. One hypothesis is that these proteins are also responsible for female infertility. Melano females will produce eggs during the act of spawning like a normal female, but something happens during the hatching process that causes the fertilized egg to rupture. Because allmost all melano black (mm) females are not fertile, mostly blue females are used to breed melano blacks. Preferably steel females are used because these females posses the least irridescense of all blues. A pairing like this, produces melano-geno (Mm) fish in the F1 generation. 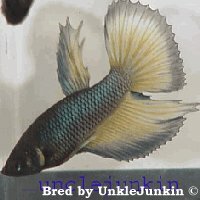 When breeding to F1 generation fish together, there is a chance of getting melano blacks (mm) back in the F2 generation. However the blacks from a pairing like this always posses some irridescence on on the body. There are several reports of melano marble and melano copper females being normally fertile and can be normally used for breeding. 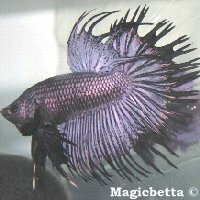 The 'Black Lace' betta is a dark colored fish that rarely approaches the depth and intensity of the melano black . 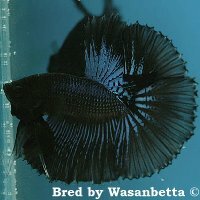 Most Black Lace fish display too much iridescence in body and fins to be competitive in the black class, and are instead shown into the dark bicolor class. Most black lace fish we see today come out of marble strains. It is thought that first black lace colored fish arose from Oriental non-red stock. 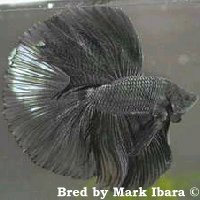 The ends of the fins of black lace fish should be clear or cellophane in color, causing the 'lacy' look that gave this type of black its name. Amateur hobbyists in particular need to be careful not to confuse black lace with melano butterfly, the fins of which can also fade to clear or smoke. Unlike the black lace, the melano butterfly will still maintain a very dark black or blue-black body color, and are still genetically melanos. Like melano black, black lace is recessive to normal dark color. Unlike melano, black lace female are normally fertile. 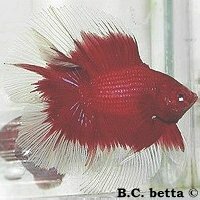 This type of red bettas are called extended because the normal red pigment has increased in density and distribution [3,8]. 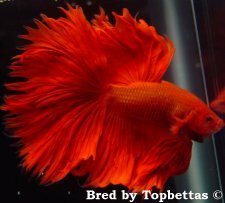 The red color is spread over the entire body and fins of the fish on a similar way like the spread iridescence (Si) gene for the iridescent colors. The extended red (Er) mutation is dominant over the gene for normal red color (R). 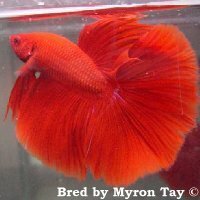 Ideally the extended red betta should carry no iridescence and no black scales. Most extended red lines carry some degree of iridescence. 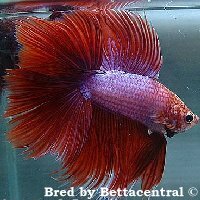 This due to the fact that many breeder tried to improve the finnage of their red line by outcrossing to superfinned iridescent lines. The red is then bred back from these lines but the iridescence is hard to loose. - Outcrossing different red lines. - Outcrossing to cambodian bettas. - Outcrossing to yellow (non-red) bettas. - Outcrossing to orange bettas. 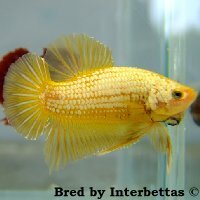 Note: Outcrossing to cambodian, yellow and orange bettas most of the time will result in less intense colored red offspring. 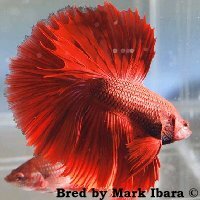 The red-loss trait will cause the red color in young bettas to disappear when it matures. When the fish ages or due to fin damage, the red color sometimes returns. 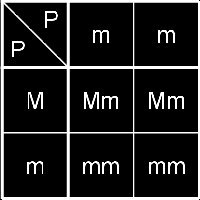 It is thought that the red-loss mutation was introduced together with the marble mutation (see below), because most marbles do not show any red pigment . The red-loss trait is caused by distinct gene than the marble gene (which affects the black coloration), the red-loss (Rl) gene. The red-loss mutation is extremely variable in its expression and is dominant over all other Red genes, except extended red. Non-red is believed to be a mutation of the red gene. The non-red gene (nr) is recessive to the wildtype red (NR) gene. Two varieties of the non-red gene are known: yellow (nr1) and orange (nr2). 1. The term non-red had been used previously to describe similar abnormalities in other organisms. 2. To avoid having people making the assumption that there was a single gene that would generate the yellow phenotype. - Yellow type 2: Intensive colored yellow . - Pineapple: These fish are the result of a normally extended red fish showing the non-red phenotype . Pineapples are not clean yellows because they show black-scaling. 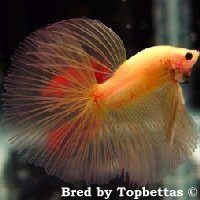 Orange bettas are relative new development. The nr2 gene causes a more of a red/yellow (orange) color. A very deep, pumpkin orange with minimal black scale effect is desired. Orange isn't an easy color to maintain. It is has been reported that over time spawns of orange x orange can become washed-out in appearance. Regular outcrossing to black-orange lines might help to maintain the intensity. Some butterflies only show a small clear band around the fins while others have allmost completely clear fins. But there are many degrees of the butterfly pattern between these two extremes. The ideal butterfly pattern shows an equal division between color and clear fins. The butterfly patterns is caused by a mutated gene called variegated fins (Vf) . The variegated fin mutation is dominant but the effects of this mutation are, as mention before, highly variable from fish to fish. 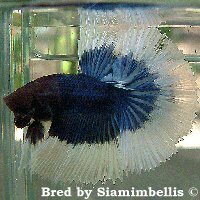 Note: When a betta carries the butterfly pattern and is melano carrier the clear edges can also be black colored. 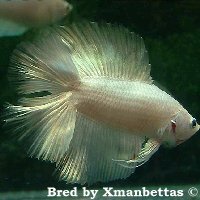 The marble betta was created in the beginning of the 1970s by Orville Gulley, a prison inmate at the penal institute in Indiana [3, 8]. Orville as breeding betta here in peanut butter jars, as part of a rehabilitation program. 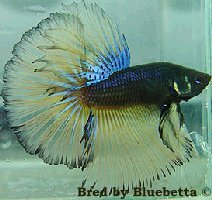 The story goes that Orville was trying to create a black butterfly betta which then led to the discovery of the marble gene. Walt Maurus and a handfull of other breeders started to breed the marbles for pattern and this lead to the distrubution of the marbles all over the United States. The orginal marbles were black and white but now they are available in virtually every color imaginable. 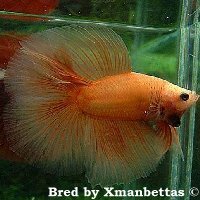 In young marbles bettas the marble pattern can shift from week to week and once the fish matures most of the times the pattern is fixed. 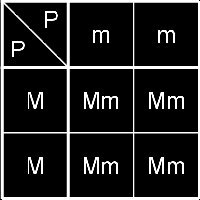 The marble mutation appears to be a partly dominant gene, the marble (Mb) gene, which has a highly variable expression. 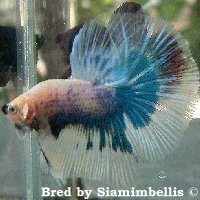 When marbles are introduced into a true-breeding solid colored line, it is becomes very difficult for the breeder to return his stock to a non-marble true-breeding solid colored type. The Mustard gas was created by Jude Als (Unkle Junkin). 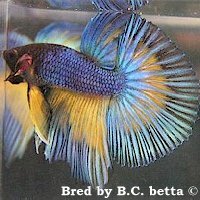 The original Mustard gas bettas had a solid blue/greenish body and yellow fins. Because this line bred true Jude Als thought of this strain name, but actually they are not more then blue/yellow bicolor fishes. As you can see on the pictures above, nowadays, the term mustard gas is a very plastic term. The pattern of the colors of the different MGs differs from fish to fish. Some fishes also have blue/green/black edges around their fins while others lack these features. Most of the "modern" Mustard don't even come close to the original of Jude Als. 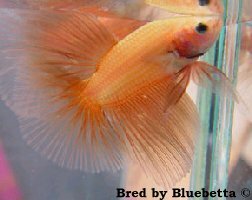 Because of these controversy, on shows mustard gas bettas are classified into the bicolored class. 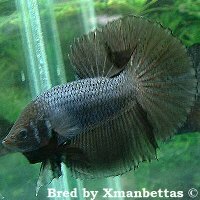 Chocolate Bettas as they are commonly called, have a brown body with yellow fins. 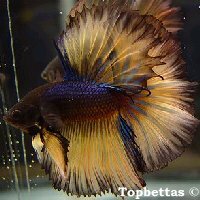 But actually they are black/Yellow bicolor bettas. Chocolates are often bred to yellow in order to improve the color of both lines. 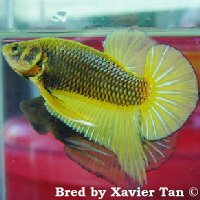 On shows like mustard gas bettas, chocolates are classified into the bicolored class. Opaques were created by Dr. Gene Lucas. 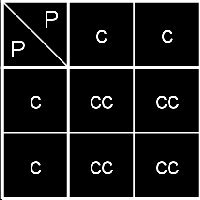 To be correct opaque itself isn't a color but a trait which is characterized by a thick powdery appearance. 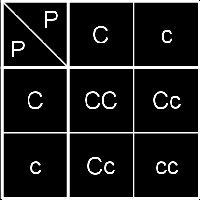 The opaque (Op) factor is inherited by intermediate (partial) dominance. Opaque does not necessarily mean white, there are actually three types; steel blue, green and blue (royal blue) opaques. Opaque whites are actually steel blue opaques. Green and blue opaques have a green or blue sheen instead of pure white colour. The genetic make up of a opaque white is represented by: C bl Si Nr Op . 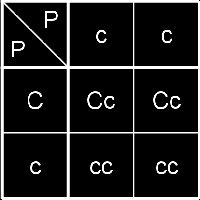 C - The cambodian gene for lack of dark body pigment which causes the light body. bl - Steel blue pigment which appears silvery-white when on a light background. Si - The spread of the iridocyte pigment, in this case steel blue over the fish. Nr - Non-red, causes the inability to produce red pigment. Op - Opaque, the special gene that cause the powdery appearence of the fish. 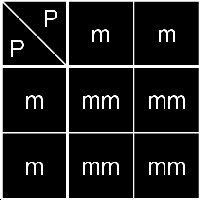 Note: It is also possible for opaques to arise as a result of marble genes. In order for that to happen off course the steel iridescence and the opaque factor must be present. The I.B.C. 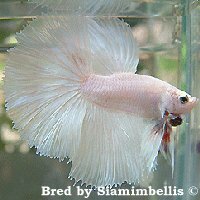 judging standards define this breed (Opaques) as: Non-Red light bodied fish similiar in appearance to Pastels. However, there are guanine deposits giving a denser milkier appearance and an opacity to the coloration of these fish. These deposits are most visible around the head and eye and continue to accumulate as the betta ages. 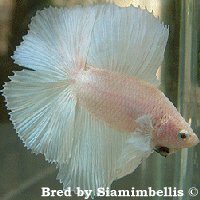 The thick powdery "white" pigment is the key to distinguish an opaque and a pastel betta. This can most easily be observed by looking at the fish from above and around the head. The genetic make up of a pastel is C Bl Si Nr. (Op – Opaque, optional but necessary to a degree. If too littely opaque factor, the fish appear translucent, and if too much, they may be classified as Opaques). Note: To be entirely correct opaques are actually also pastels with the only difference that opaques carry much more opaque factor than pastels. 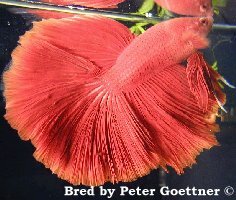 The now so popular copper color and "mask" characteristic are both developments which were created by crossing Betta splendens to Betta mahachai and/or Betta imbellis. The latter two species naturally have a higher degree of iridescence on the scales to compensate for the murkier waters of their native lands . 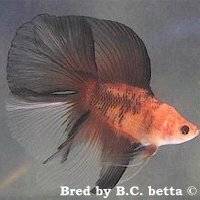 Outcrossing these species to betta splendens and selective breeding resulted in true breeding hybrid plakat bettas which were called 'copper imbellis'. These fish possessed two new features; (1) metallic scaling and (2) masking. 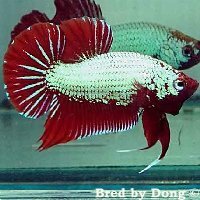 By selective breeding, the Asian breeders succeeded to develop the copper imbellis into a longfinned line and selectively breeding lead to a heavy and thick metallic/copper color and a masking which was more or less covering the head. The typical metallic/copper sheen is caused by the crystalline layer. Whereas in classic blue-green the iridophores are all the same size and shape, metallic iridophores are characterized by different shapes and sizes. Because of this the crystaline layer influences the refraction of the light spectrum which could be an explaination for the color changes which sometimes can be observed in metallics. The copper/metellic color and the "mask" characteristic are distinct traits which both are inherited by intermediate (partial) dominance. Crossing copper to a normal blue (non-metallic) will give metallic blues in the first generation (F1) with a chance of getting copper back in the next generation (F2). The same accounts for the mask characteristic. When a full mask fish (homozygous mask) is paired with a non-masked fish this can lead to heterozygous mask offspring (F1). Keep in mind here that the degree of masking will greatly differ in the offspring, some will show some masking while other don't show it. The next generation (F2) will give you fish with more masking signs or maybe even some full masks. I think selection also plays a great role here. Still a lot of experimenting can be done with these relavitely new traits. These traits can be combined with other colors like blue, melano, opaque, red, yellow, etc. Both traits influence all other colortypes and the possibilities seem allmost unlimited! 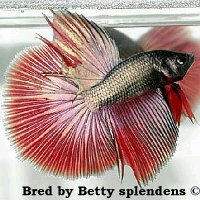 The first dragons arose few years after the metallic mutation had established itself in the betta hobby. Dragons are characterized by an exceptional thick iridescence on the body. 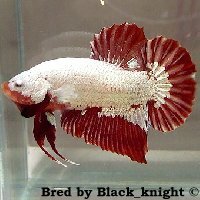 The exact origin of this trait is not known but like metallics, there is a good chance dragons originate from outcrossing to wild bettas. The main difference between metallics and dragons lies in the development of the iridescence in young fish. With metallics the defenite color is already visible in an early stage of development (~2 months of age), but with dragons the iridescence becomes thicker and thicker as the fish matures. These dragon trait can be combined with many other colors and more knowledge on this trait still has to be collected on its genetic behavior.